The best get better. You’ve no doubt heard it before, but there’s some truth to that well-worn phrase. People who make a habit of excelling do so by commitment to continuous improvement. That applies to our company and core products. SIGNWarehouse offers some of the best-selling printers in America. And they just got better. The PrismJET line of large format printers has been the best-selling MUTOH-made products in America for over a decade. PrismJET offers exceptional value by delivering OEM quality at The SIGNWarehouse price. 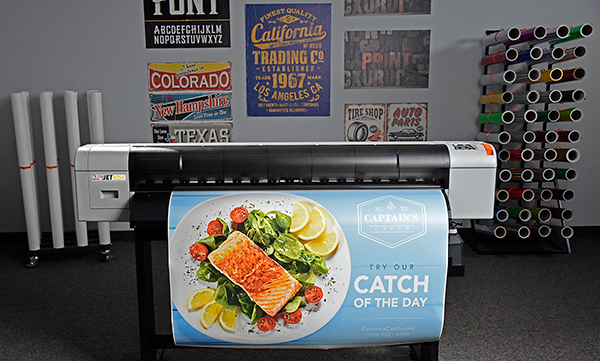 The new PrismJET VJ54 large format eco-solvent printer follows the VJ48 Plus. The differences between the VJ48 Plus and the new VJ54 can be summarized in three words; bigger, better, faster. Before we dive into the details, let’s get the big picture. The buying power of SignWarehouse leverages the best products in the sign industry to bring you unbeatable value for the dollar. The PrismJET VJ54 is the newest in a long line of PrismJET large format printers dating back to 2002. During the last 15 years, the PrismJET name has become synonymous with quality and value. Fig 1: Wave printing hides banding while combining speed and quality. 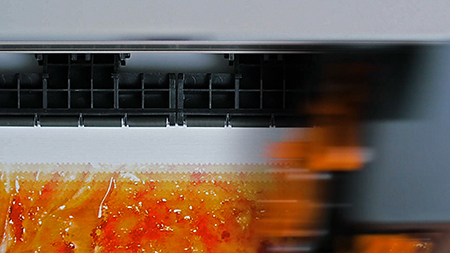 As the name implies, the PrismJET VJ54 is a 54″ eco-solvent inkjet printer. It’s built around an advanced, variable dot, micro-piezo print head with a maximum resolution 1440 x 1440 dpi. Like all PrismJET VJ series printers, the VJ54 head incorporates MUTOH’s patented wave print firmware which virtually eliminates banding and allows you to print high quality images at speeds that support profitable print production (Fig 1). 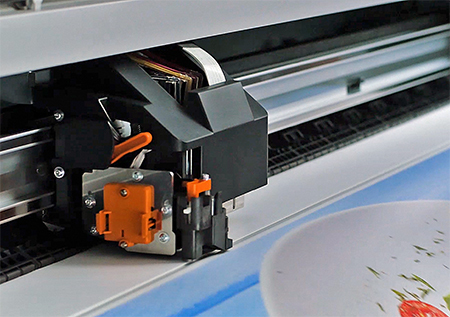 MUTOH manufacturing make this a printer with a proven track record of rock solid reliability. Speaking of proven reliability, the PrismJET VJ54 can be used with EnduraINK PRO or ECO ULTRA eco-solvent inks. Either option produces vivid color, superior gamut, and exceptional abrasion resistance, plus UV resistance that supports outdoor use for up to 3 years without lamination. The PrismJET VJ54’s advanced print technology and eco-solvent ink make it an excellent choice for producing outdoor-durable banners, signs, decals, fleet graphics, vehicle wraps, wall graphics and much more. The ink is free from harmful VOCs and is safe for indoor use. Fig 2: LXI RIP 12 is a complete design & RIP print production application. 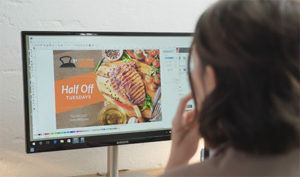 Because we understand that creating eye-catching graphics is the first step to success, we offer the PrismJET VJ54 with LXI RIP 12, a complete software package that includes a powerful yet intuitive graphic design suite plus a professional quality RIP engine (Fig 2). There is a Flexi Subscription option for those who want to incorporate the PrismJET VJ54 into a complex work environment with other printers. The PrismJET VJ54 is backed by Lifetime technical support and comes with the peace of mind of available on-site warranty coverage up to three years. That outstanding support package includes ICC profiles for all your favorite PrismJET media plus OEM print media from Avery, 3M, ORACAL and more. VJ48 Plus to VJ54: What’s changed? Loyal customers will know that most of these features and benefits were also available on the PrismJET VJ48 Plus, which has been replaced by the VJ54. So how does the new model compare to its predecessor? Here’s where those three words come in; bigger, better, faster. Bigger: The PrismJET VJ54 accepts industry-standard 54″ media. This means you now have immediate access to the widest possible variety of compatible print media. That variety includes artist canvas, banner media, backlit film, cast and calendared vinyl, one-way view window film, photo paper, perforated vinyl, static cling, T-shirt transfer film, roll-up banner film, wall media, and more. Faster: The maximum print speed has been increased by 15%. The VJ54 produces high-resolution 720 x 720 dpi prints at print speeds up to 159 square feet/hour. Fig 3: DropMaster technology enhances consistent print quality. Better: The VJ54 offers important new standard and optional features. The print head now incorporates DropMaster technology which maintains an optimal distance between the head and media for improved dot placement accuracy (Fig 3). This new feature maintains outstanding print quality with both thick and thin print media. There’s also an access panel for easier maintenance, and a dual-motor media take-up system included with each printer. The available high-capacity ink adapter supports much longer print runs without swapping out depleted cartridges. This option improves both efficiency and economy. And there’s an optional on-board spectrophotometer to meet the color management needs of the most demanding sign and print shops. It’s clear that the VJ54 is a step forward for the PrismJET product line. The PrismJET VJ54 keeps the patented wave print firmware and advanced piezo print technology that made the VJ48 Plus an industry sales leader. To that winning formula, the VJ54 adds wider print and media widths, faster high-quality print speeds, DropMaster ink technology and other improved standard and optional features. So the best has indeed gotten better. The best-selling PrismJET VJ48 Plus has been replaced by a printer that’s better, bigger, and faster. What about that price and value thing? Prices start at only $9,995.00 with a dual-motor media take-up system, LXI RIP 12 design and RIP software, EnduraINK PRO ink starter kit, and a one year on-site warranty. The PrismJET VJ54 Print and Cut package adds a 54″ Q Series cutter for simultaneous print-and-cut decal production for only $12,995.00. All of this comes from a product with a proven track record, lifetime tech support and rock-solid reliability. That’s Value with a capital V. If you’d like to see the PrismJET VJ54 in action, ogle the spec sheet, or place an order, click here to get started. Questions? Accolades? Drop ’em in the comments section below.